Baked Chicken Breasts in the oven are deliciously seasoned and perfectly juicy. 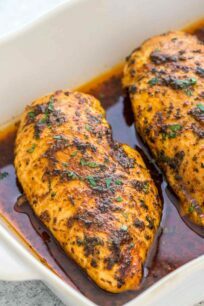 This homemade recipe is super easy to follow and requires simply a mixture of herbs, olive oil or butter, and chicken breasts. 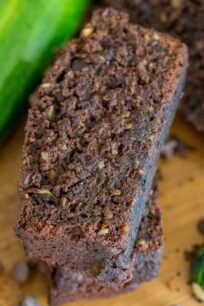 It yields the most tender and flavorful meat that can go on salads, sandwiches or even casseroles. It doesn’t get much better than this! This is one of the easiest and most delicious meals you can prepare in a short time. In addition, the cooked chicken breasts store well, and leftovers are just as great. 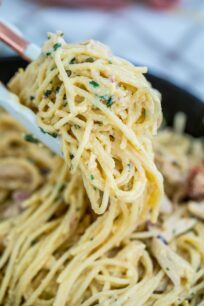 You can even make Homemade Chicken Noodle Soup or Chicken Spaghetti Casserole with it. Whatever you decide to use it for, it is guaranteed to make a satisfying and tasty meal. Baked Chicken Breasts in the oven are always tender, flavorful, perfectly cooked and smell heavenly. Though it is a simple and easy dish to make, it is very important not to overcook the meat. If cooked the wrong way or for too long, you will end with dry and rubbery meat, which you want to avoid. 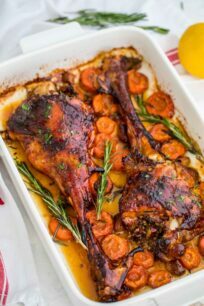 We will guide you on how to best cook them in the oven, to get the perfect meal that you will love. Baked Chicken Breasts are easy to customize with your favorite seasonings or toppings. They are naturally lean, Keto friendly and high in protein which makes them ideal for any meal. Similarly, you can bake them with your favorite veggies, such as asparagus, broccoli or bok-choy, for a more nutritious and healthy meal. What do you need to make Baked Chicken Breasts? Boneless, skinless chicken breasts – the kind and sizes you use are totally up to you. Also, you can use fresh or frozen meat. For frozen meat, make sure to thaw before using. Butter or olive oil – both ingredients work well, but butter will give this dish the best flavor, and also some juiciness and richness to it. Since chicken breasts are generally lean, butter works great because it gives some tenderness to them. Seasoning – we use a mixture of garlic powder, Italian seasoning, paprika, salt, and pepper. However, this is really very preferential, and you can mix it up with your favorite seasonings. For example, you could add rosemary, thyme, dried basil, red chili peppers if you prefer. Salt and Water – to make the meat tender and juicy, you want to soak it for at least 30 minute or a few hours in a brine. For this, you will need some lukewarm water and salt. This step is optional, but we strongly recommend it. Cooking Thermometer – this is optional but it is a handy tool to have in the kitchen. It is the best way to ensure that your meat is not over or under-cooked. Also, it is not expensive, so we highly recommend to get one. How do you brine the chicken breasts? Take 3-4 chicken breasts and place in a large bowl. In a separate bowl, pour 4 cups lukewarm water (about 90 to 100 degrees Fahrenheit). Then, add 1/4 cup salt, and stir to combine. Pour the brine mixture over the chicken breasts and set aside for at least 15 to 30 minutes. If you are doing this in advance, cover the meat and refrigerate the bowl of chicken and brine for up to 4-6 hours. When ready, pour out the brine, then take each chicken piece and rinse under cold water. Then, pat dry with paper towels. It’s that easy, yet it makes a huge difference in texture and juiciness of the meat. How to season the Chicken Breasts with SEASONING BLEND? Prepare the seasoning by mixing together garlic powder, onion powder, Italian seasoning, dried parsley, basil, thyme, paprika, salt, and pepper. Then, simply sprinkle the seasoning over the meat, or rub it. Make sure not to over-power the bird with too much seasoning, so keep it simple. What temperature to bake chicken breasts? Over the years we have tried cooking the breast meat at various temperatures, and we concluded that cooking it at 400 degrees F yields the perfect result. Chicken breasts are naturally lean, so it is important to set the right temperature when cooking. Also, you want to rest the meat for at least 10-15 minutes before baking. This will allow the butter and herbs to absorb into it. Depending on the thickness of the breast, roasting at 400 degrees F requires a cooking time of about 25-30 minutes. Cooking at a higher heat develops a nicer and crispier crust on the outside of the breasts, which also locks the juice better, and keeps the meat perfectly tender on the inside. It is recommended to start checking on it after about 25-minute mark, to ensure it is not overcooked, sooner for a smaller size meat cut. Check with a cooking thermometer, as the internal temperature should be around 160 degrees F. Once it hits this mark, we usually remove the meat from the oven and let it rest for additional 5-10 minutes. Resting it will let the temperature to climb on its own to 165 degrees F internally, and ensure the meat is not over-cooked. Similarly, it will let the juices reabsorb into the chicken, resulting in perfectly tender meat. What goes with oven baked chicken breasts as a side dish? 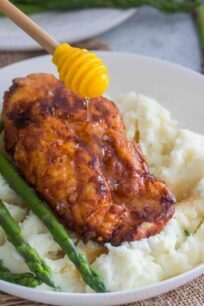 How to store baked chicken breasts? Before refrigerating the meat, make sure it is completely cooled. Then, transfer it into an airtight container and refrigerated to up to 4 days. HOW TO FREEZE COOKED CHICKEN BREASTS? Ensure the meat is cooled before freezing. Next, wrap each cooked breasts in plastic wrap, then add a layer of aluminum foil over it. Transfer the wrapped meat to a freezer bag, and freeze for up to 3 months. When ready to eat, remove from freezer and set in the fridge overnight to thaw out. Chicken breasts cook easily, so be extra careful not to overcook them. Let them rest 5-10 minutes before slicing. Use your own seasoning or store-bought. Baked Chicken Breasts in the oven are deliciously seasoned and perfectly juicy. 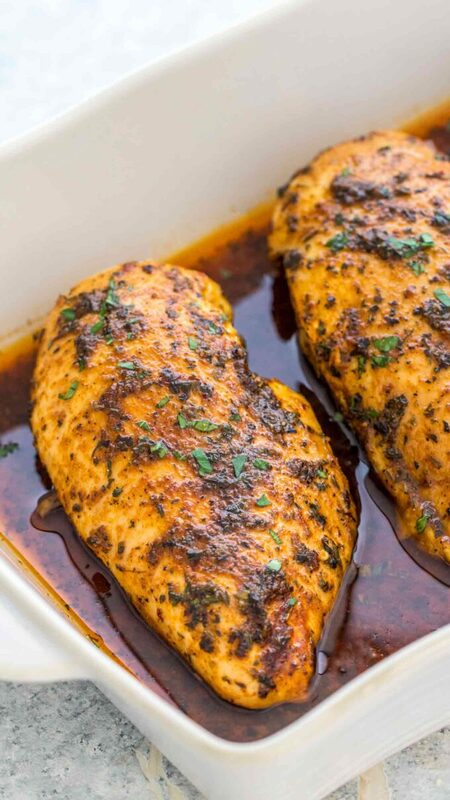 This homemade recipe is super easy to follow and requires simply a mixture of herbs, olive oil or butter, and chicken breasts. To brine chicken breasts, fill a large bowl with 1 quart of lukewarm water and 1/4 cup salt. Then, stir to combine until the salt is dissolved. Next, add the meat to the brine mixture and let it sit for 30 minutes. Also, you could cover the bowl and refrigerate for up to 6 hours. When ready to cook, remove them from the brine, and rinse under cold water. Lastly, pat them dry with some paper towels. Preheat oven to 400°F. Lightly grease of a 9x13 inch baking dish with a few tablespoons of olive oil. In a small bowl mix: salt, pepper, Italian seasoning, garlic powder, onion powder, paprika, dried thyme, dried basil, dried parsley and pepper flakes. 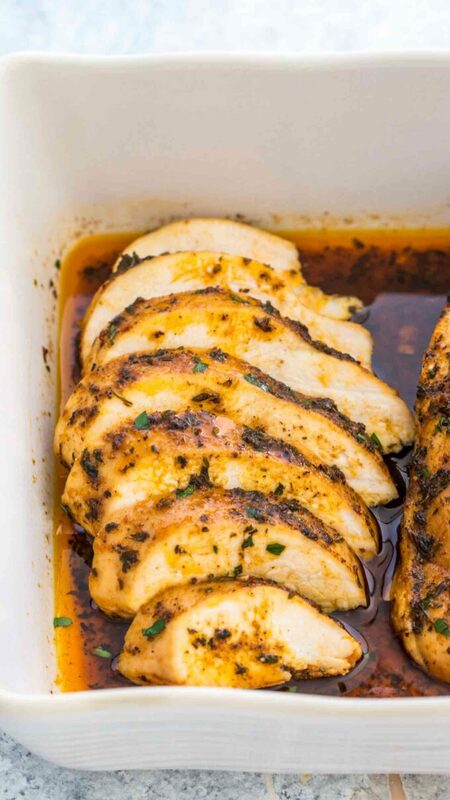 Rub the chicken breasts with olive oil or melted butter and seasoning on both sides. Rub well so it absorbs properly. Add chicken to the prepared baking dish and bake for 25-30 minutes or until internal temperature reaches 165°F. Before slicing, let rest for 5-10 minutes for optimal tenderness. I can’t believe I’ve never thought brining chicken breasts!! We always brine our turkey for Thanksgiving. This is so genius! Thank you so much! These look bursting with flavor !! I cannot wait to try !! Thanks for the great tips on how to brine the chicken! It worked perfectly! 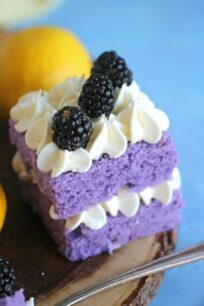 These look so juicy! Perfect weeknight meal! Totally my kind of comfort food dinner! 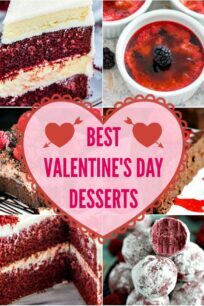 I need to put these on my menu next week! 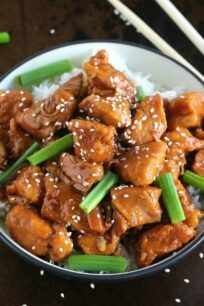 I want to cook this chicken dish up this week! 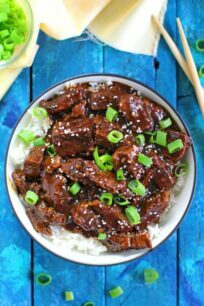 Deliciously easy and so great for meal prep! Do you pour the melted butter into the baking dish with the chicken before cooking? It appears there is a “juice” of some kind in picture. The juice is from the olive oil, while it cooks the chicken also releases juice and that’s the sauce. I am definitely going to try this. I like to cook in bulk. Bake extra 1 or 2 pieces and freeze for later use. 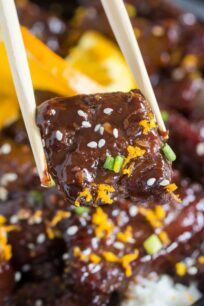 Made these last night very delicious and flavorful, my whole familly loved this recipe. Very juicy and tender!! 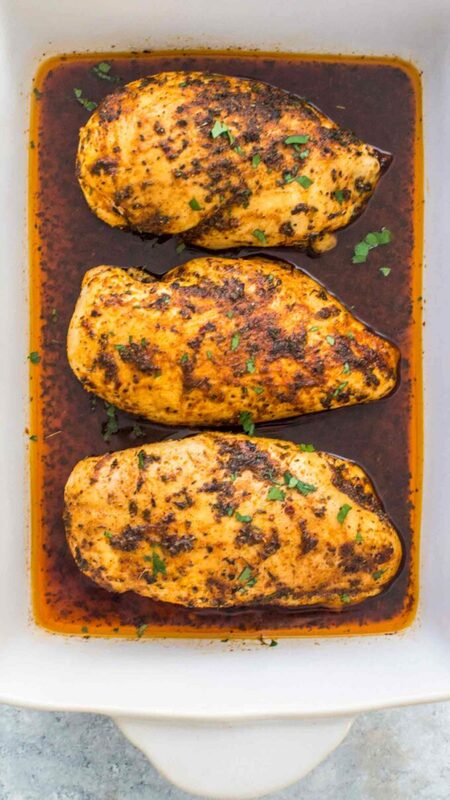 This is the only way I am making my chicken breasts now, I followed the recipe to a T many times and every time the meat is so juicy and flavorful!! I make now a double batch that I later use on salads and in wraps.